Home » Posts Tagged "Sibling Tree"
Hello World! Our Family Tree business began after Christmas 2009. 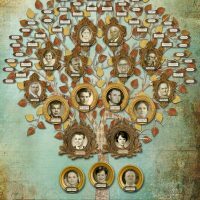 I produced this family tree as a gift for my parents. They are great geanealogy lovers, and I made the tree to celebrate their research and my mother being accepted into the Daughters of the American Revolution. I displayed their tree at a photography show (I’m also a photographer) and I’ve been in the family tree business ever since. Click on the image to see a large version.